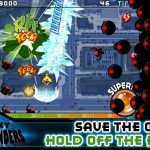 Superplay Games’ newest title Sky Defenders is a tilt-based top-down survival game with rich comic-book style graphics, but borrows much too heavily in the game play department. 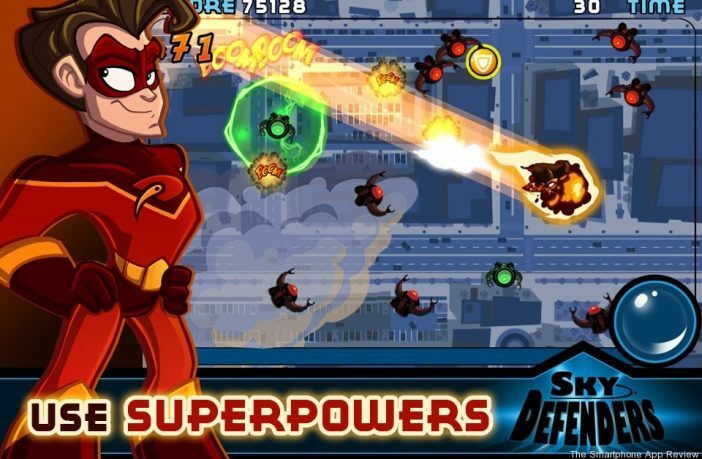 The goal of the game is to move your Superhero around the screen, avoiding hordes of evil robots to pickup power-ups which, in turn, help you destroy the robots. You are trying to smash as many robots as possible in the time allotted. The game is deftly controlled via the iDevice’s accelerometer. 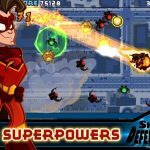 When the review request came in for Sky Defenders I was initially really excited as it looked kind of similar to one of my all-time favorite iOS titles, Tilt to Live. It wasn’t until I got my hands on it that I quickly realized JUST HOW SIMILAR the game was. There is no mistaking the fact that Sky Defenders was heavily influenced by One Man Left’s Tilt to Live’s classic mode. The evil robots’ red LED eyes look remarkably similar to the evil red dots in Tilt to Live. And the power-ups match those in Tilt to Live nearly one-for-one in both shape and function. From the ice beam which freezes robots, to warp hole that collects robots in its black hole like grip, there are also, shield, lighting and bombs as well. However, unlike Tilt to Live all of the power-ups are randomly available right from the get go and do not need to be unlocked. I would have preferred to see a bit more originality here, rather than a rehash of what Tilt to Live already did. 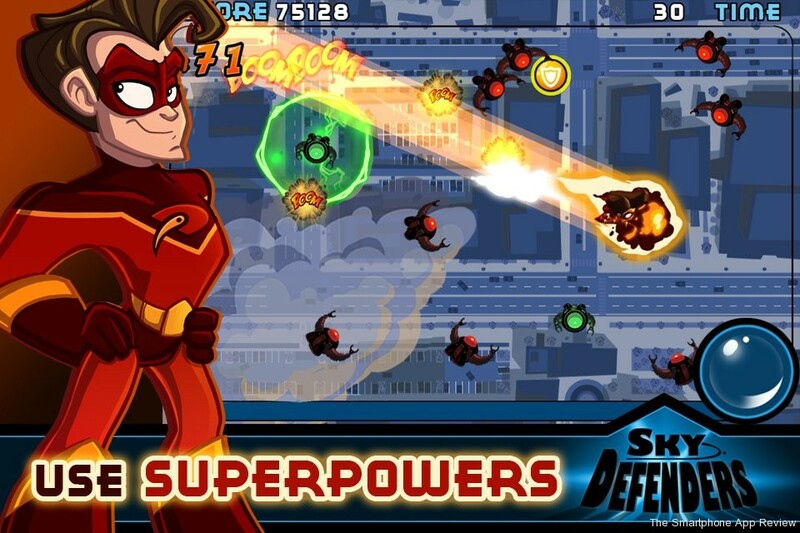 With a Superhero theme, the sky’s the limit when it comes to crazy weapons! It seems like Superplay Games has lifted a lot of its game play elements directly from Tilt to Live. 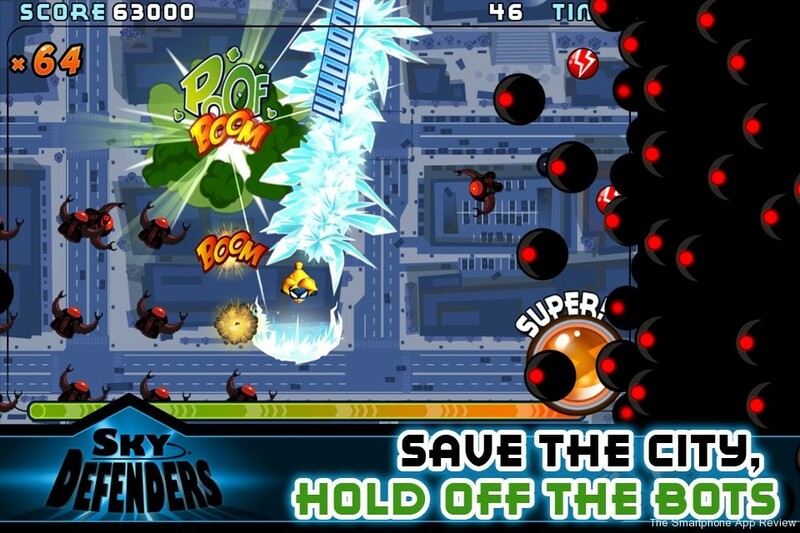 However, Sky Defenders is not a complete copy of Tilt to Live, there are a few new elements in the form of daily challenges and an in-game credit currency which can be use to purchase special abilities like faster movement, increased powerup spawning etc on a per game basis. Of course these credits can be purchased in bundles for real money as IAPs or you can play to earn them. Larger amounts of credits are rewarded on a daily basis if you meet the requirements of the daily challenge, which is usually for smashing x number of robots in a single game. Players also have a selection of two different playable characters (I’d love to see more added in future updates), each of which offer slight differences in game play, mostly in terms of their explosive super combo move. The ‘playing field’ in Sky Defenders is not constrained to dimensions of the screen, panning as the player reaches the edge of the screen, resulting in a more open-world feel. 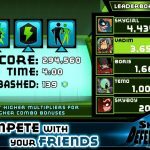 High Score leaderboards rely solely on Facebook, which in my opinion, is an unfortunate choice and Superplay Games should really consider adding Game Center or OpenFeint support. Right now my daily leaderboard consists only of me and the two built-in scores. I’d be lying if I didn’t say that Sky Defenders is a fun and polished game in its own right, because really it is. It has nice graphics and the tilt controls seem rock solid. For me, it is the fact that the game is SO very similar to Tilt to Live that leaves a sour taste in my mouth and kept me from fully endorsing the game. 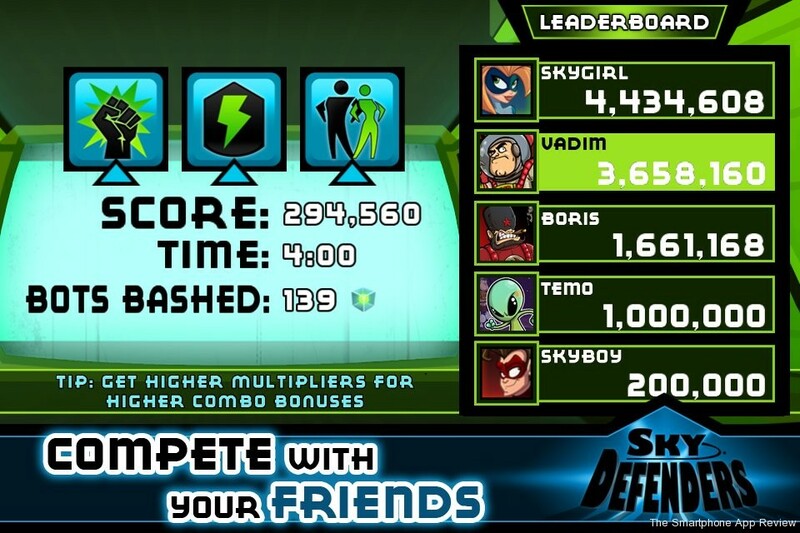 Sky Defenders is currently free, so you might as well give it a download. Its Superhero theme has mass appeal, perhaps more so than Tilt to Live’s more abstract dots and pointer, but I still highly recommend spending the $2.99 on Tilt to Live (or grab the free to play iPad version) which is a better (and more challenging) game offering much more variety in game play. 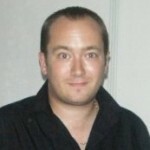 This review originally appeared on AppAddict.net and is published here as part of an agreement between our sites.